Unusual but very attractive half-tented rooms, superb game viewing and fantastic service and little touches make a stay here a memorable experience! Savanna isn’t the most flash or luxurious of the Sabi Sands lodges (some other lodges are verging on the OTT in opulence) but what really makes it stand out is the fantastic service and countless little touches from the tireless staff – like coming back from game drive to find your bath already drawn and sherries poured! 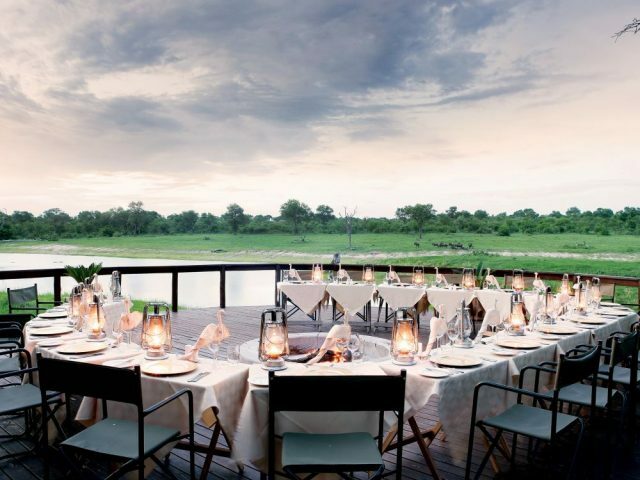 The Sabi Sands reserve has a well-deserved reputation for delivering the finest game viewing experience in South Africa, and Savanna makes for an excellent base to explore its game-rich expanses. The lodge is located on the southern border of the reserve’s western sector, just a short drive once you enter the Newington Gate. This makes Savanna easier and quicker to reach than many of its fellow lodges, but it does also mean that it’s close to the boundary fence and you have less time to soak up the vibe of being in the bush before you arrive at the camp. Once you arrive the lodge public areas exhibit fairly traditional game lodge style with a large thatched lounge and dining area with bar and upstairs library overlooking the lodge swimming pool with an active waterhole beyond. It’s perhaps not going to win any awards from the stylistas but it’s a welcoming and unpretentious space where you can while away the hours with a book enjoying great service from the unfailingly friendly staff. IS IT A TENT OR A ROOM? But if the lodge’s public areas are fairly typical, the structure of the rooms certainly aren’t. Are they rooms or are they tents? Well, they’re pretty much both at the same time in fact. The structure of the rooms are the usual solid brick walls and tiled floors, but this has been attractively combined with a canvas tented roof with romantically draped interior ceiling so that they in many ways combine the best of both worlds – guests who might find the feeling of sleeping in a full tent a bit too exposed enjoy the security that comes with solid walls, whilst the tented ceiling/roof adds both romance as well as allowing more of those unforgettable night sounds of the bush to enter as you lie cosy in your bed at night. The interior décor of all the rooms is unashamedly restrained and elegant with classic white linen and dark polished wood furniture (again if you’re looking for cutting edge contemporary style you’ve come to the wrong lodge) For us what really stands out are the gorgeous bathrooms with their classic standalone baths and delightful outdoor showers! 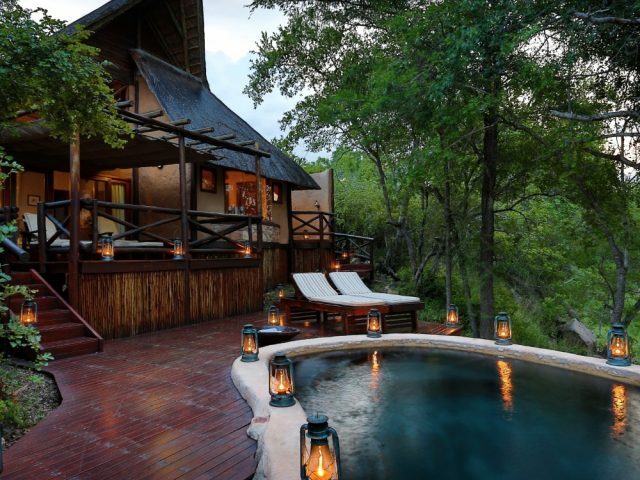 The rooms are also wonderfully private, tucked away in the vegetation with private decks overlooking little waterholes where animals can be spotted coming down to drink. In fact, there are 3 room types in all: the cheapest option being the 4 Luxury Suites whilst more money will see you calling one of the 3 Executive Suites your temporary home – both room types are very similar in look and feel with the major differences being that the Executive Suites are more spacious and also boast their own plunge pools. Having your own pool is obviously a huge drawcard in the heat of the summer months, but if you’re travelling in winter you may well prefer to save the money and stay in one of the Luxury Suites instead. But if you’re travelling as a family then what you need is the Savanna Suite. This is the only non-tented roof accommodation at Savanna, instead boasting the more usual thatched roof. 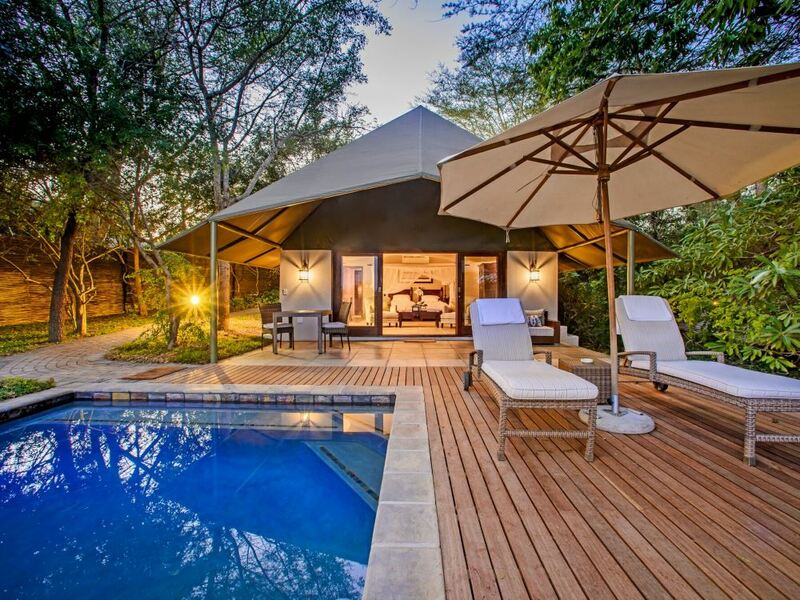 It’s basically the perfect bush home, with two en-suite bedrooms separated by a huge lounge that leads out onto a private wooden deck with plunge pool overlooking a private waterhole. Add in your own butler, a private ranger, tracker and your own dedicated game-drive vehicle – and there’s even a dedicated childminder should the need arise. 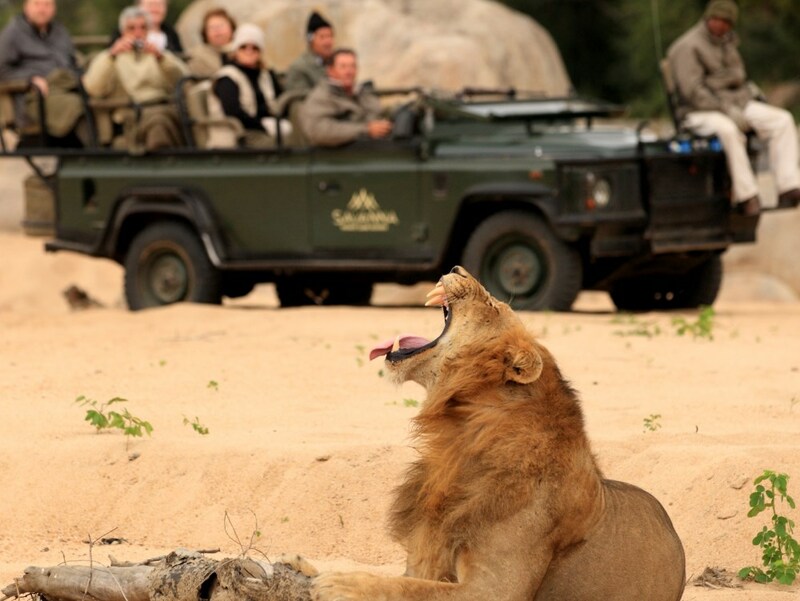 Being a safari lodge within the famed Sabi Sands reserve, Savanna’s access to fantastic game viewing is nothing short of incredible: and that’s not just along the various waterholes dotting the front of the lodge itself. Savanna’s game drives are run by expert rangers and trackers who know the land like the backs of their hands: seeing the entire Big Five in a single game drive isn’t unusual but if there’s one thing that stands out is the frequency and quality of the leopard sightings. There are – as with any five-star safari getaway worth its salt – adrenaline-pumping game walks on foot with armed rangers and personal trackers if you’re looking to leave the comfort of the specialised 4x4. These are especially interesting, as they not only get you up close with the animals, but offer profound insight into the amazing flora of the land and their medicinal and practical uses. Many of the meals at Savanna are enjoyed at the large communal table in the main dining area along with your fellow guests as well as your rangers. 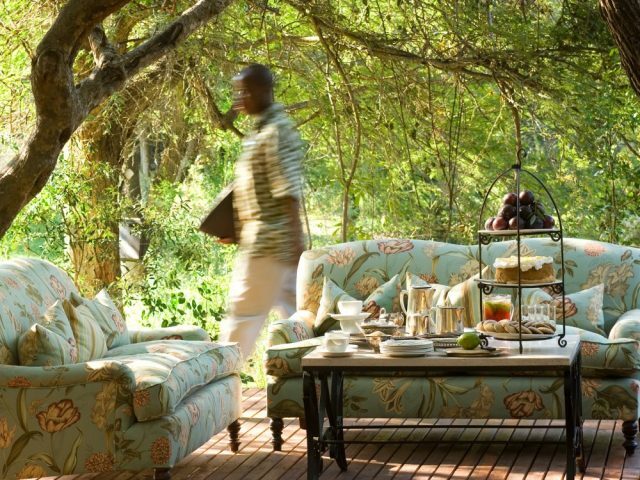 But the lodge does provide plenty of dining options including out in the bush and under the stars in the boma. Most unusual of all though has to be coming towards the end of your evening game drive and rounding a corner to be confronted by the sight of a century old train dining carriage in a clearing (the historic Selati railway built to connect the gold fields of the lowveld to the port of Lourenco Marques used to run through here) – it’s the setting for an unforgettably romantic and unique dining experience! A classic colonial-style South African safari camp with 21 elegant suites located in one of the very best game viewing areas in the country!